Los Angeles has several residential communities with upscale beaches on the Pacific coast, among them we can mention to Malibu, Santa Monica, Marina Del Rey and Palos Verde. Venice Beach, on the other hand, is famous for its young women walking in bikinis and roller skates, muscular men lifting weights and all kinds of characters. Long Beach is a growing seaport with a vibrant commercial district and oil wells. Laguna Beach has a large community of artists. 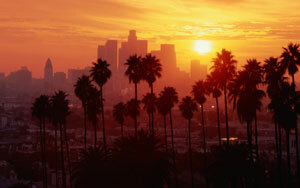 Hollywood is the historic site, home of the movie studios and Beverly Hills home to movie stars. Here you go drive Historic Route 66 on Santa Monica Boulevard. You can also visit the famous Hollywood Boulevard and Sunset Strip Street. In Burbank, you can visit modern film and television studies. In Anaheim you will see the original amusement park, Disneyland and Knott's Berry Farm. The center is a commercial district, but not the center of the city as it competes with many other surrounding neighborhoods. Near the center are the ethnic neighborhoods with large Asian populations, these neighborhoods are known as Korea Town, China Town and Japan Town. Pretty close several predominantly African-American neighborhoods and many predominately Hispanic. Griffith Park is located on the edge of Hollywood and the Planetarium. It has recreational areas, natural areas and family attractions. You can take pony rides, nature walk or take car rides. The park has an excellent view of the famous Hollywood sign. The planetarium and observatory offer science exhibits and several shows throughout the day, the evening is a popular place to see the lights of the city of LA. The Los Angeles Zoo has over 1,500 animals, birds and reptiles in their natural habitat. It is located in Griffith Park near the intersection of Golden State and Ventura freeways. The subway "Tram" is a good way to get around the park. Be sure to see Adventure Island, the new children's zoo where we can find animals native to the Southwestern United States. The Rancho La Brea Tar Pits, has starred in many Hollywood movies. For nearly forty thousand years, the mine (Pits) has issued a large amount of thick, sticky asphalt that has caught many specimens of prehistoric plants and animals. From the observation deck, you can see replicas of extinct mammals close to the bubbling tar. At the Museum George C. La Brea Discoveries page, located near the Pit, you can see fossils recovered from this place. Disneyland is the largest and most popular, is located in Anaheim. He has over 60 major attractions. Universal Studios, offers a two-part journey begins with a demonstration of the production of a film. The second part presents live entertainment and exciting themed attractions most popular films from Universal. The Six Flags Magic Mountain is a theme park Warner Brothers with more than 100 rides, shows and attractions. Many of the amusements of the Warner Brothers cartoon characters present and movies. Knott's Berry Farm in Buena Park, is the first amusement park in the United States. In it, reproduced the atmosphere of the Old West and features live entertainment, games and places to shop. Beverly Hills is the place of movie stars and other celebrities. The commercial area of this neighborhood is known for Rodeo Drive with its exclusive shopping, fine restaurants and nightclubs class. There are several hotels in Beverly Hills, but the prices can be high. Santa Monica is located at the edge of the Pacific Ocean about 30 minutes from downtown LA. In the Third Street Promenade, you'll find interesting shops, outdoor cafes and street entertainment. The Santa Monica beach is a short walk from the center of the town. Venice Beach, south of Santa Monica is famous for its unique culture and in a somewhat peculiar. Along the coast are small shops where you can find everything from trendy, inexpensive clothing to tattoos. "Muscle Beach", an outdoor gym next to the ocean where many do their exercises and the sidewalk is great to admire the beautiful "California Girls" skating in bikinis. If you prefer a beach where you can relax in the sun, away from the crowds, you have to go north or south of the city. LA residents go to Laguna, Zuma, Malibu and Pacific Palisades. These beaches are cleaner and have fewer tourist attractions. Anaheim is a commercial and residential neighborhood in the southern part of Los Angeles. Is about 30 miles south of downtown and about 20 minutes east of the nearest beaches. It attracts many tourists for its most famous attraction, Disneyland. It has a variety of moderately priced hotels, designed for the whole family, serving large crowds of tourists visiting the area. Glendale is a community with an ethnic mix, located near Hollywood and not far from downtown and Burbank. It is 30 minutes from the beach. Glendale has many shops, small businesses and commercial establishments, as well as many moderately priced apartments and some modestly priced hotels. Huntington Beach is a family beach located in South Los Angeles. It is the site preferred by tourists visiting Disneyland, in neighboring Anaheim and many residents of Los Angeles. In this area you can find hotels along the beach with modest prices. Some of the most notable art institutions present in the city include the Museum of Art Los Angeles County (LACMA), Getty Center, the Norton Simon Museum and the Simon Wiesenthal Center. There are also numerous art galleries in the sector, especially in Hollywood and Santa Monica. In consideration of the performances, there are places like the Music Center of Los Angeles County (which houses the Dorothy Chandler Pavilion, home of the Los Angeles Opera, the Ahmanson Theatre, which represent several Broadway productions, the Mark Taper Forum, and the Walt Disney Concert Hall), the Ford Amphitheater, the Grauman's Chinese Theatre, Hollywood Bowl, the Pantages Theatre and the new home of the Oscars, the Kodak Theatre.